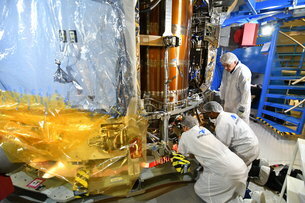 Technicians instal the radiators on the European Service Module for NASA’s Orion spacecraft marking the module’s finished integration. 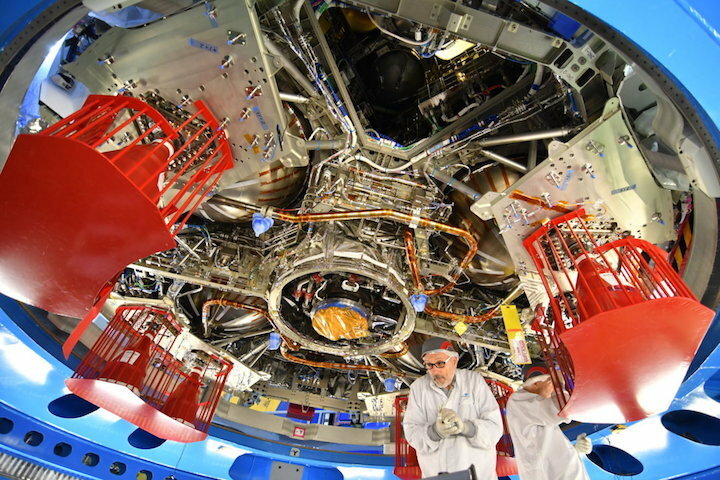 Technicians working on the European Service Module for NASA’s Orion. 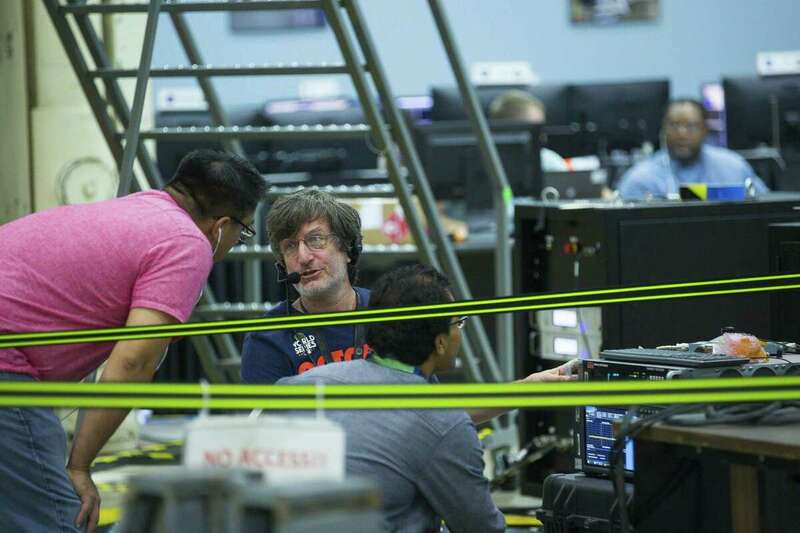 Chasing Orion: This is the fifth in a series of stories leading up to the April 2019 launch of Orion’s launch abort system, which is managed by NASA’s Johnson Space Center in Houston. When NASA launches the Orion spacecraft to the moon in the coming years, the fate of the four-person crew — for a short while, anyway — depends on four large bolts. These bolts will automatically explode if the systems detect a problem with the rocket in the seconds after launch, separating the crew module from the boosters so those on board can escape a fiery death. But before humans strap into the spacecraft, NASA must design and test this escape mechanism (known as the launch abort system) on a mockup module, a simplified version of the real Orion. 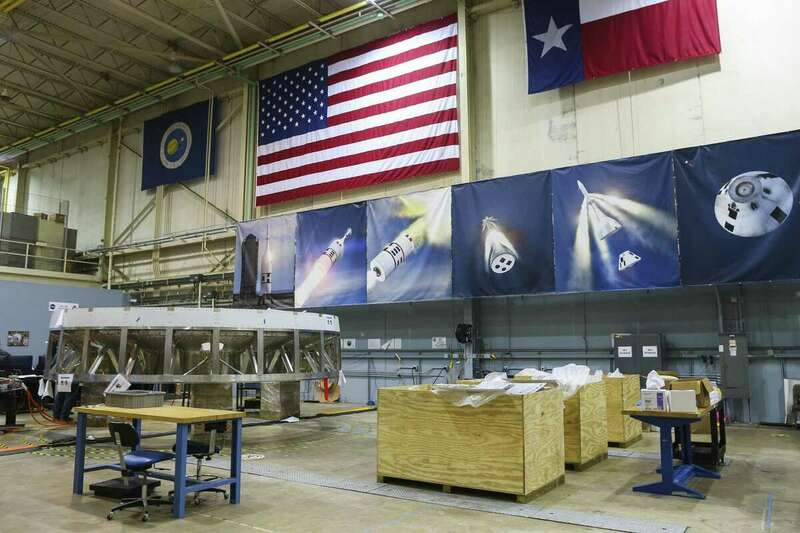 And this month, personnel at NASA’s Johnson Space Center in Houston are getting ready to install those bolts on this mockup, the next step in their year-long design process leading up to the April 2019 test. “We’re just chugging along,” project manager Jon Olansen said. On that day in April, the mockup capsule will launch from Cape Canaveral, Fla., fulfilling its only purpose before sinking to the bottom of the ocean: testing the primary safety feature for the spacecraft that will take humans back to the moon for the first time in 50 years. 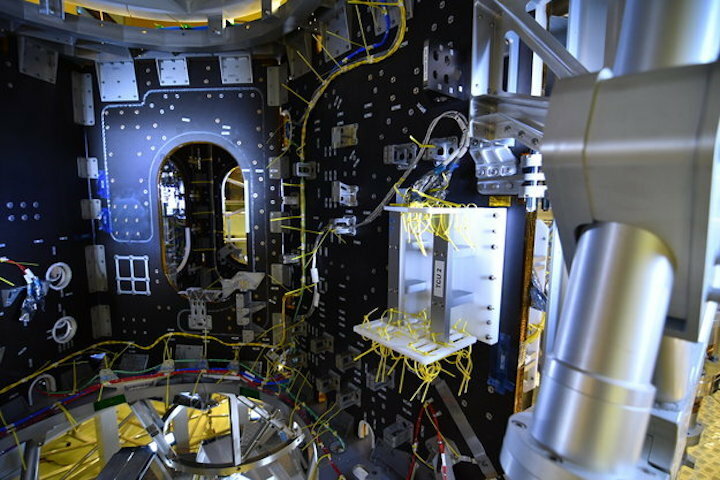 Personnel at the Houston center have been working on the module since March, where they outfitted it with flight computers, communication systems and about 800 data sensors. They also put it through flight simulations, as well as weight and center of gravity testing because it must have the exact same measurements as the real Orion when humans are on board. 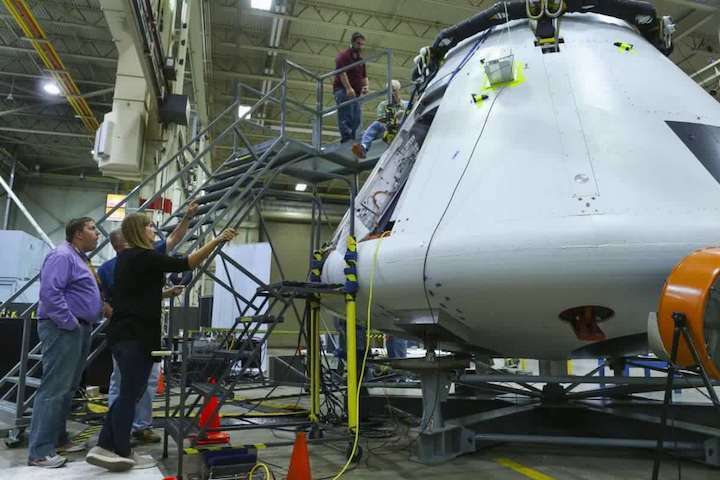 Earlier this month, the mockup crew module returned to Johnson from NASA’s Ohio-based Glenn Research Center, where it underwent four days of acoustic tests designed to ensure the capsule is structurally sound. It passed with flying colors, Olansen said, so now the Houston center will attach the crew module to the separation ring — this is where the four large bolts come in — which connects the module to the rocket booster and allows it to separate from the rocket if necessary. “Those four bolts are the only thing connecting the crew module to the booster,” Olansen said. “When you blow those four bolts, that’s how the crew module separates” from the rest of launch system. 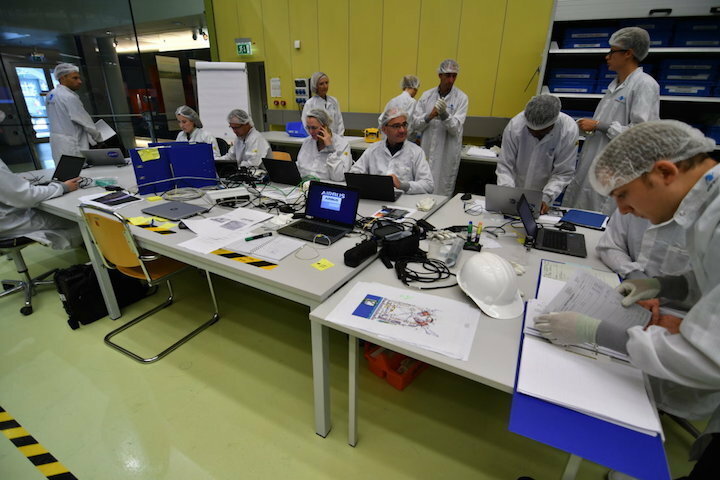 Johnson personnel also are designing Orion’s cockpit and flight software, spacesuits and parachutes. Just this week, Johnson successfully completed the last parachute test at the U.S. Army’s Yuma Proving Ground in Arizona. Johnson is home to the nation’s astronaut corps, where human space flight research and training take place. It also is home to the International Space Station’s mission operations and the Orion program. Olansen expects personnel to begin bolting the separation ring to the crew module around Sept. 24, he said, and then it will take about two weeks to link the crew module computer systems to those in the separation ring. Once that’s complete, Johnson personnel will run the capsule and its attachment through a battery of tests to ensure everything is working properly. 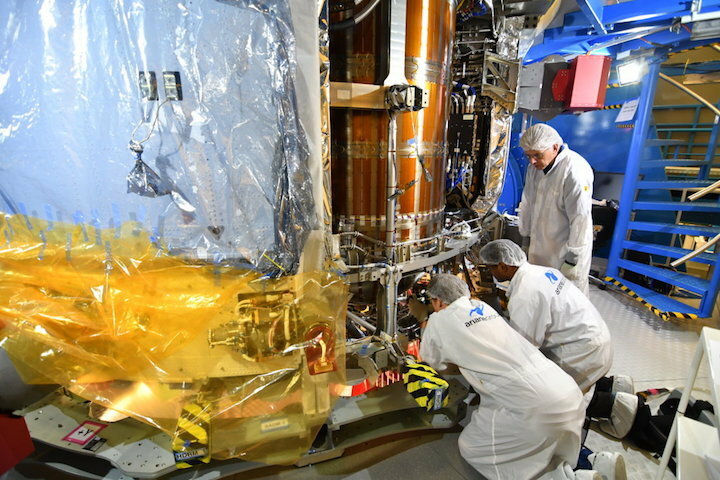 It’s the last step before Olansen ships it off to NASA’s Florida-based Kennedy Space Center in November, where it will stay until the launch in April. “A good portion of the team is going to be at KSC from December until the launch in April,” he said.